If you are in 7th grade you are eligible to referee in the 2nd grade program. These games are held at Sprague every Sunday at 2:00 and 3:45. Each referee will help out with a team for 30 minutes and then referee the game with another 7th Grade Referee. You will be given a uniform - a black shirt and socks, however you must provide your own watch. Payment will be $10 per game. If you are interested in refereeing in this program please contact Roxy Lee-Stewart. If you are in 8th grade you are eligible to referee in the 3rd grade program. These games are held on Saturdays (girls games at 9AM, boys games at 3PM) at the Sprague Field Complex. The games are 30 Minutes a half. You will be given a uniform - a black shirt, socks and a whistle, however you must provide your own watch. Payment will be $15 per game. If you are interested in refereeing in this program please contact Roxy Lee-Stewart. To become an "official" referee you must take a course offered by the MSRC (Massachusetts State Referee Committee). The course which most youth take is called a Grade 8 license (which has nothing to do with your grade in school). This is a one day course. These courses are not held in Wellesley, but several are in surrounding towns. You can find a list of courses/dates by going to the MSRC web site (www.massref.net). Grade 8 referees are licensed to referee 7v7 and 9v9 games as well as be Assistant Referees for 11v11 games. This Grade 8 license serves most high school referees very well. If you take this course and become a certified referee, the Wellesley United Soccer Club will reimburse you for the course cost. To be assigned to referee the 11v11 games you must take the Grade 8 course offered by the MSRC. This course requires 16 hours of classroom time which is broken down into several days. Our experience is that older referees - 12th graders or adults - have the skill and confidence needed to referee these older players. If you have your grade 9 license you could sign up for the 'Bridge' course which only requires 8 hours of classroom time. Again, just visit the MSRC web site (www.massref.net) to sign up for the training courses and then let us know as soon as you're available to referee! 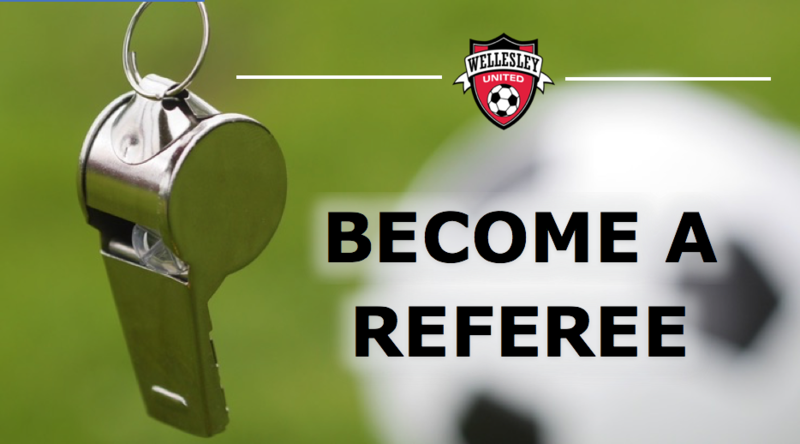 Any player within the Wellesley United Soccer Club can take the course to become a qualified referee. They must be 14 years of age as this is the minimum age required by Mass Youth Soccer to officiate at games in BAYS. Referees in University/College will need to provide a copy of their current transcript alongside their recertification paperwork.